In one week I saw the spectrum of human emotion play out in the streets in two very different situations. Sunday, September 18, Atlanta, GA. It was the second day of Music Midtown, a music festival held in Piedmont Park in downtown Atlanta. The weather predicted rain all day long, so my crew and I prepared with dollar store ponchos and zip lock bags for our valuables (having dropped my phone in the New River two weeks earlier, I wasn’t making the same mistake twice). The cold grey clouds loomed ominously over our heads all morning long. After a thoroughly underwhelming set by… some generic band I don’t even remember, they opened up and dropped a steady rain on the 100,000 people in the largest park in downtown Atlanta. Evacuation signs appeared on the LED boards flanking each side of the stage telling us to head to the nearest exit in a “calm and orderly” fashion. Naturally we held our ground, thinking it would be over soon and we could go back to the party. Despite our best efforts, however, the rain and threat of lightning forced us to find our way out of the park and into the streets. We (along with the 999,994 other music fans) suddenly were a roving band of music thirsty gypsies of various states of intoxication. With no plan, no word from organizers when/if the show would continue and plenty of booze-fueled energy flowing through us, we knew we had to find our own party, or at least a bar that would let us sit our soaked butts down for a few drinks. Not knowing where we were or where we were going, and with every bar we passed packed to capacity, the situation looked bleak. The crew was restless. We had no choice but to continue searching. Eventually we turned a corner and saw a small group of people outside of a bar. The bar was still full, but it had open air windows. Not quite the size of a garage door, but large enough that the music from inside the bar could be heard outside. At first it was just a few people happily hanging out. “It’ll be broken up in a few minutes” we thought, despite the street being closed. Then the group got bigger. Then more people joined in. All of a sudden, like a moth to a flame, it turned into a full force dance party. With hundreds of displaced festival goers looking for a party, and the rain steadily falling, it soon became its own living breathing organism. The scene that is forever seared into my memory happened when a man in a wheelchair became the center of the dance party. Moving his chariot back in forth in the most rhythmic way possible, for the moment he became the epicenter of all that is good, righteous and pure. In that moment, there were no barriers, no inhibitions and no worries. Despite not being able to walk, this man led the entire crowd in the most enthusiastic dance party I had ever witnessed. In that moment, all I could feel was absolute joy to the degree of which I had rarely experienced. I wasn’t the only person in my crew who had a tear brought to my eye by this surreal scene. Eventually, the dance party thinned out, the sun came out, the rain continued to fall and word got around that the music festival was back on. As waves of festival-goers marched back into the park, we all knowingly gave each other a look that what we just witnessed was indeed special. The exuberance and communal feeling of that moment is one that I will never forget. It was truly the high end of positive emotion in the vast spectrum that is human emotion. At the time I wouldn’t have believed it, but in the next week, I would also see the exact opposite of that emotion played out in the streets of the city that I call home. Read Part II here. 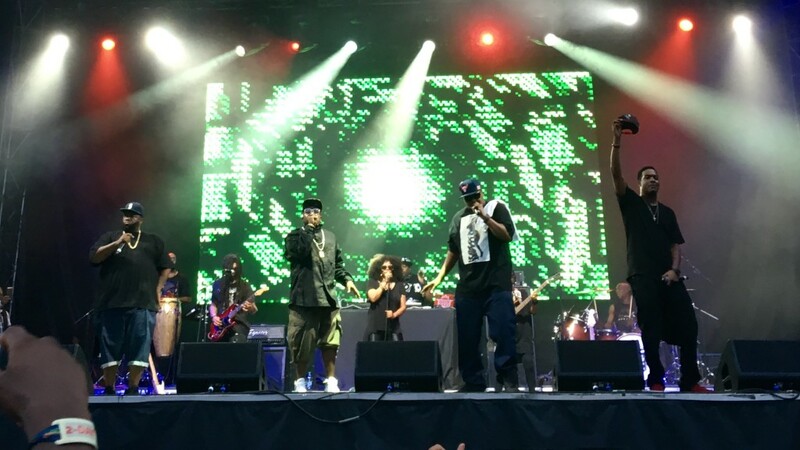 This entry was posted in Blog and tagged Atlanta, Big Boi, CLTure, dancing in the rain, live music, love, music festival, Music Midtown, OutKast, serendipity. Bookmark the permalink.